Do you think that the Rose Petal Hobo is a darling as we do? Choose red or black Nappa leather. Gunmetal hardware. Shoulder straps with rings. Zip top. Rose petal detail. Made in Italy. 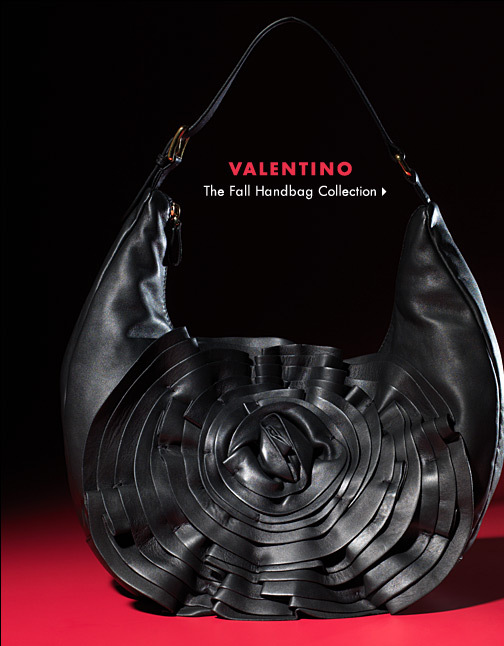 The above pictured handbag is from the Valentino collection and can currently be purchased at Neiman Marcus style # NMF10_V0C1U (Available as of Sept. 18, 2009; we can not promise it will be available later today or tomorrow). Shop at Neiman Marcus for luxury fashion brands and fashion accessories. Learn more about what is on trends in 2009.